Hello Kai! Can you tell us a bit about yourself? I am an educator turned entrepreneur on a quest to make quality education accessible, for students, globally. Tell us about your newest venture! What inspired it? Additionally, how have your previous professional careers influenced what you are working on right now? I created a startup that creates virtual classrooms and inclusive VR field trips. While teaching history, many of my students lacked the basic resources needed to have a quality education. Lack of exposure, lack of food at home and sometimes not being enrolled in free lunch programs, lack of exposure to life outside their direct communities, and lack of knowledge about opportunities in which they could greatly benefit. 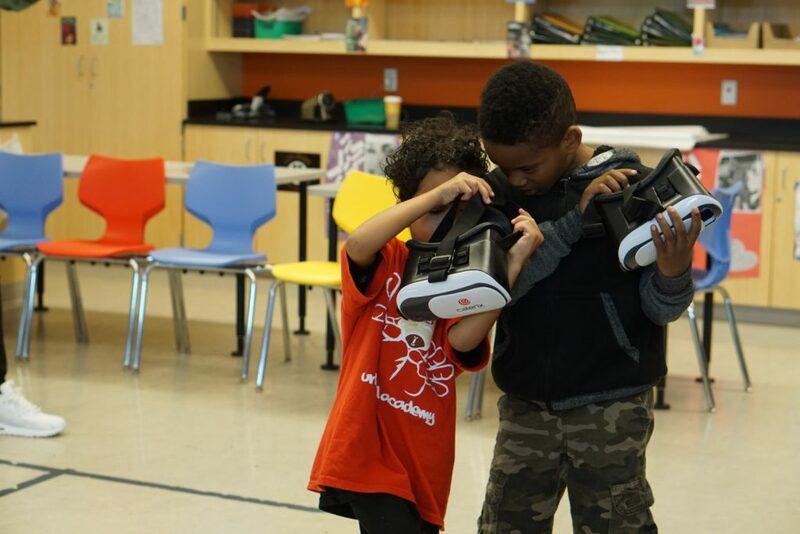 While working in museums, I was in awe of how much my students could benefit from the exhibitions, however, most museums lacked outreach programs that reached out to underserved communities. My startup uses virtual reality to fix the gap in resources and accessibility. Many people call VR, “empathy machines” and a good portion of VR content revolves around making users have empathy for marginalized narratives. I think people are overlooking one of its most powerful capabilities– access and exposure. I see VR as a way to expose students to the world around them and give them access to opportunities that historically have not been available to them. I moved to the Bay Area–specifically Oakland, CA, because I felt it was where History & technology collided. What does it mean to be a storyteller? I love the African proverb, “Until the lion learns how to write, every story will glorify the hunter.” To me, being a storyteller means relentlessly telling the stories that matter to me, on my terms. Many narratives are written at such a high level, they exclude audiences because they can’t comprehend the words. I enjoy taking complicated subjects and breaking them down so everyone has a chance to understand the issues and have digestible information so they may think critically for themselves. What are the kinds of stories you want to tell? I want to tell stories that will empower underrepresented groups to remember that they came from greatness. There are not enough people telling these stories which could be life-changing if a child is exposed to their history & culture at a young age. When reading our History textbooks, my Hispanic students would often ask me, “Ms. Frazier, Where am I in the History book?” and I would have to tell them, “you’re not included in this text.” Students internalized that very early– that they don’t matter. That their stories don’t matter. I want to change that narrative by bringing underrepresented stories to the forefront. 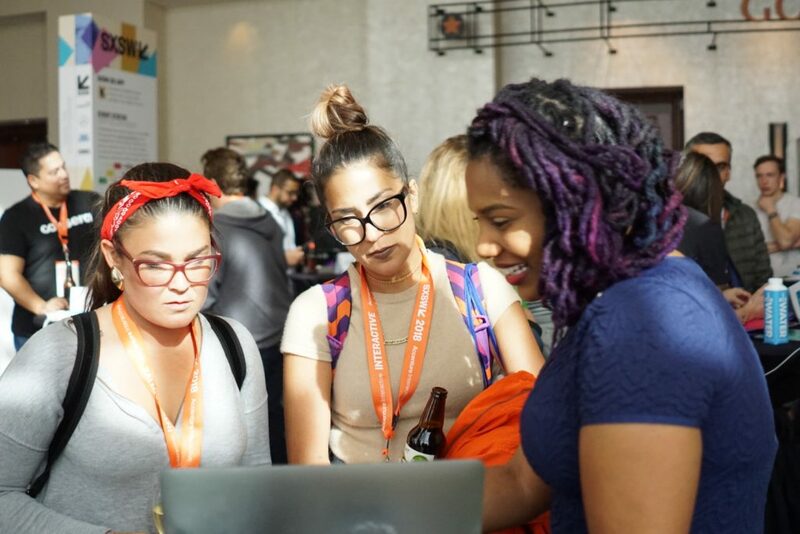 Why is diversity, inclusion, and equity so important in the world of tech, design and creative storytelling/creative production? For me, this is the most level a playing field has been for new media. When the internet came out, not all of us had computers. When cell phones came out, we weren’t always the first ones to have the new tech and still used pagers. When social media hit, I remember being in college in 2004 & checking daily to see if Facebook made it to my campus as it went to the more privileged PWI schools, first. I say all this because a good portion of us have smartphones and laptops. All you need for our VR is a web browser to enter a URL. That’s it. And most of us have access to that. Which means we can be present to create and design this new world from the ground level. That excites the hell outta me! My goal is to excite other people of color to get into creative mixed reality design as all of our voices and perspectives are needed to create an equitable VR ecosystem where we can all see ourselves in the content. What keeps you going when you feel stuck, unmotivated, etc.? I value my peace at all cost. I take time daily, to disconnect. I don’t like having my cell phone or laptop near me because I know how an alert or notification can have an effect on your mental health. When I feel stuck or unmotivated, I take the time to find peace and quiet so I can refocus and think about the big picture and what it will take to reach my next critical milestone. Can you share some tips about how to overcome imposter syndrome? I’ve never had an issue with imposter syndrome. I know my work ethic, strength and what I bring to the table. When I look at others, I realize they may be more talented than me but many will never have the strength to lean into their talent. That saddens me, greatly. I have many talented friends that could make a huge impact on the world, but they aren’t able to mentally manifest their greatness. I’m the annoying friend that preaches to everyone about taking the time to reflect on what makes them unique and the time being now to dive into their passion and make a difference in the world. What is your advice for anyone in the creative field?–particularly for those from underrepresented groups? Underrepresented groups not only make the culture–we ARE the culture. Their creativity will shape history for future generations enabling others to find their passion. There are numerous lanes that are untouched, waiting for us to fill the void. That’s why we need more diverse voices. But we also have to look at the creative mediums of the future. It is essential that creatives begin to dabble in creative design in technology. If not, there will be an entire field, devoid of our voices and expression. Kai Frazier is a historian (B.A History) and innovative educator (M.Ed) passionate about utilizing technology to provide inclusive opportunities and increased accessibility in cultural institutions for students & young adults. She is the founder & CEO of Curated x Kai, an award-winning virtual reality company which creates inclusive VR field trips as well as virtual classrooms. Through intense outreach, CxK delivers those experiences to students & young adults, including those in underserved communities. 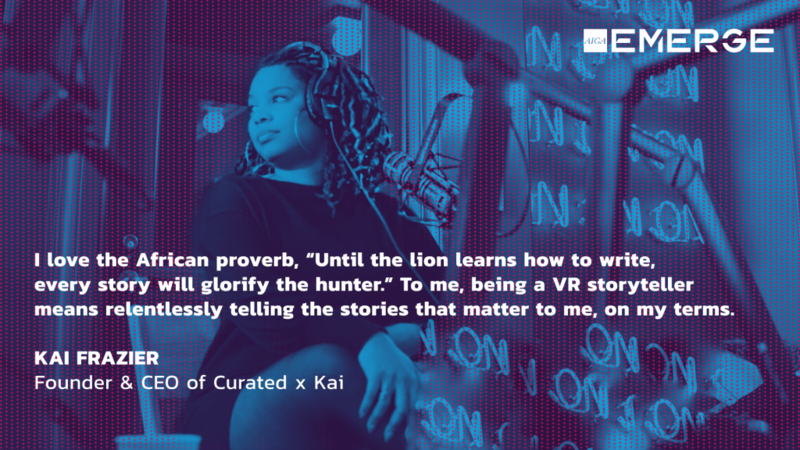 Before creating Curated x Kai, she worked with several museums such as the United States Holocaust Memorial Museum as well as the Smithsonian National Museum of African American History & Culture, specializing in digital strategy and content creation. Due to her work in the museum space, Kai was appointed to the Board of Directors for The Museum Computer Network, MCN, which advances the digital transformation of museums. Kai is a DC Fem Tech Award recipient, which celebrates power women in code, design, and data. In addition, Kai is a fellow of Facebook’s Oculus Launchpad which provides people from underrepresented backgrounds funding and resources to ensure diversity of thought in the VR ecosystem. Her work has been featured in Forbes, NBC & Black Enterprise.